The Media Lab is located in Room 362 on the 3rd floor of the Main Campus. 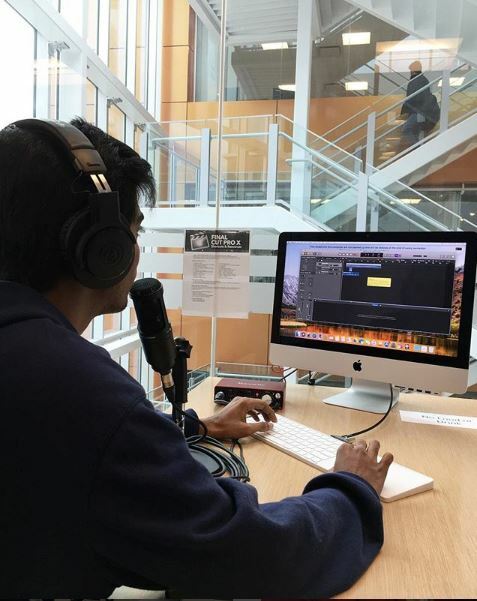 Students are able to use the lab, rent DSLR cameras and related filmmaking equipment, or work at one of the four iMac stations available. A MacBook and projector for private video editing are available in the Library for use in a study room. 4 digital audio interfaces for audio recording (microphones, headphones, headphone mixers, and stands). Final Cut Pro, Logic Audio, Adobe Creative Suite. To gain access to the lab, please email the Media Lab Coordinator, Jean Hebert. Please note that because Media Lab resources are limited for now (5 computer workstations, 5 cameras), Columbia College is granting access to select courses for specified periods of time in order to effectively track capacity and student experiences before potentially opening up access further. However, students who are not enrolled in these select courses are more than welcome to email the Media Lab Coordinator and request access to the lab for specific school projects they are working on.